Knowing the story behind Costco's stock history reveals some clues about potential future successes. People have bought and sold things for thousands of years, and the retail industry is a trillion-dollar business in today's economy. Yet even in the long history of retail, a few companies have come up with innovations that have dramatically changed the way people shop. Costco Wholesale (NASDAQ:COST) is one such company, with its big-box warehouse stores and membership model marking a definite shift away from the way that other retailers work. 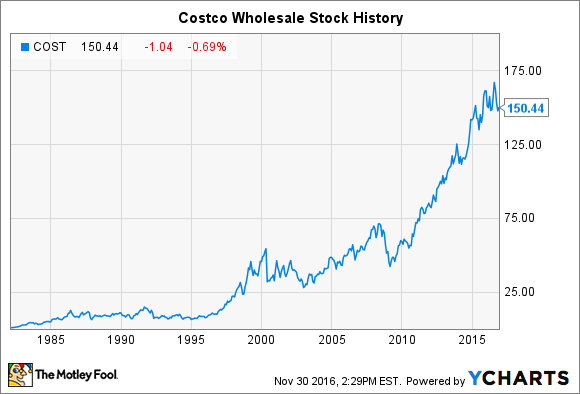 Looking back at Costco's stock history, you can see how consistent dividends and strong stock-price performance have combined to bring the company success. Below, we'll look at how Costco has evolved over time and what could lie ahead for the retailer. As you can see above, Costco's stock history divides into several distinct periods. From the early 1980s through the mid-1990s, Costco stock made modest gains as the company identified its niche and began to grow. Yet in the late 1990s, Costco took off, boosting its store count by roughly half over a five-year period from 1995 to 2000 and taking full advantage of the economic boom. The fact that Costco is located in the Seattle area also drove interest in the retailer's stock, given how important the Pacific Northwest was in the internet boom during that period. As the technology bust hit the stock market, Costco gave up some of its gains. But when a rebound occurred, Costco took advantage of the better conditions, again rising to new heights. The financial crisis and recession in 2008 and 2009 had a short-term impact on the stock, but since then, shares have soared, more than tripling from their worst levels during the crisis and showing the resiliency of Costco's business model. Perhaps the most impressive thing about Costco's stock performance in recent years is how the company has seemed almost invulnerable to pressures that are hitting much of the rest of the retail industry. Competition from online retail has thrown many traditional big-box retailers for a loop, forcing some to reconsider their entire business models -- and even forcing some out of business entirely. But Costco offers a couple of advantages that have proven to be difficult for online retail to replicate. First, Costco's warehouses create a visceral reaction among shoppers, with mountains of products that encourage bulk buying and bargain hunting. In addition, Costco works hard to refresh its product offerings constantly, bringing in new varieties in different areas of the store to encourage repeat shopping. Perhaps most important is the fact that Costco shoppers already have a sunk cost invested in the company just by being members. By paying an upfront membership fee, customers who overcome that initial threshold feel motivated to get their money's worth by maximizing savings through more frequent shopping. For Costco, membership fee revenue is essentially free profit, allowing the retailer to reduce prices further than most of its rivals can afford to do. Still, the ride higher for Costco shareholders hasn't come without bumps along the way. A lot of controversy surrounded the retailer's decision to switch financial providers for its store-branded credit card, moving away from American Express (NYSE:AXP) toward a Citigroup alternative using the Visa network. For some customers, the transition was less than perfectly smooth, but overall, recent financial results from the warehouse retailer have showed that Costco has managed to cut the payment processing fees it has had to pay. That could put more money in Costco's pocket while hopefully continuing to make card users feel comfortable with the new arrangement. What's next for Costco from here? One thing that's been true for thousands of years remains true today: The more you can cut the costs of doing business, the better you'll be able to do at doing business. Costco doesn't invest huge amounts in making its warehouses look particularly spiffy, but it makes sure that there's plenty of desirable merchandise for customers to buy. By emphasizing volume at the expense of price, Costco remains dedicated to giving shoppers good deals. That's a formula that has worked throughout Costco's history and should continue to do so for the foreseeable future.